Explosive fuel in 2016, Royal National Park, Princes Highway in suburban Sydney, where fire started that killed 3 firefighters and maimed 6 in 1983 – thirty years later the fuel is much worse. Surveyor Mitchell rode through Sydney’s sandstone country “on many a dark night” with Aboriginal boys “tearing off the stringy bark which served for torches, and setting fire to the grass trees to light my way”.This country is now thick scrub. You can’t run or ride a horse through it, even in broad daylight. In February 1791, Aboriginal fires were burning in this sandstone country under mid-forties temperatures and howling north westerly winds. In what is now Parramatta Park, parrots and flying foxes were dropping dead from the sky. Imagine what Tim Flannery’s “Climate Crazies” would say about it now! But the European settlement wasn’t touched by the fires. On another extreme day, 5th December 1792, one hut and some gardens and fences at Sydney got burnt, as well as a thatched hut, some outbuildings and a stack of wheat at Arndell’s farm near Parramatta. The fires were “got under” by settlers with green branches. Weather conditions were no worse in Sydney in 1994, when uncontrollable fires burnt 30,000 hectares and hundreds of houses, and people died despite huge armies of firefighters with the latest technology. Mullins’ said; dad shook his head and said “something’s really wrong”. He was dead right. It’s the 3-dimensionally continuous fuels which create firestorms and showers of embers that light spots miles ahead of the front. One run of fire jumped nearly a kilometre over the Woronora River before claiming human life. There were four other places where runs of fire under extreme weather were contained in areas previously treated by mild burning. Mullins says homes were lost at Tathra because of climate change. 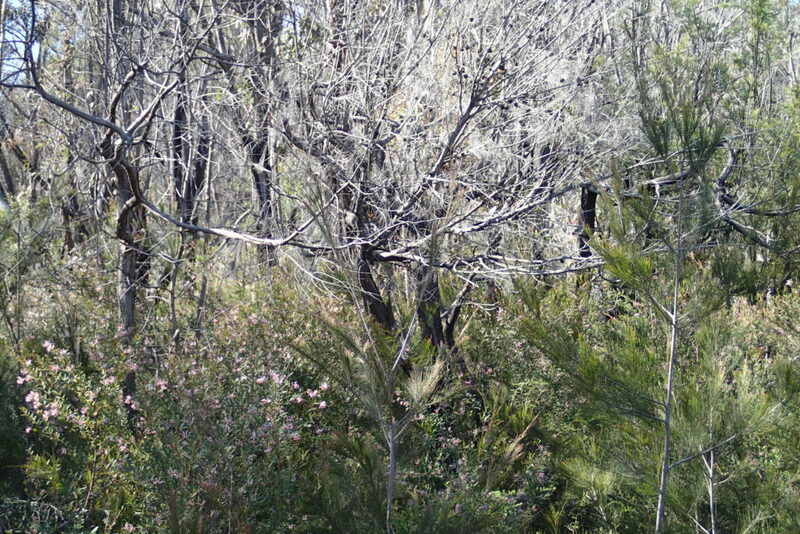 Same thing again – fire exploded in thick scrub, and jumped the Bega River. Water bombers are a bad joke. If the same money was put into sensible management – mild burning – people and houses and wildlife would be safe in any weather. Surveyor Evanssaw Aborigines burning patches of thick scrub in the Blue Mountains with high intensity fires in summer 1814, and the fires died down as soon as they reached open woodland. In contrast, a week after snowfalls in winter 2015, more than 100 firefighters with tankers and water bombers were required to save houses in the same area because the woodlands have been engulfed by scrub. Mullins wants our elected leaders to “step up” and “protect us from an uncertain future”. The Prime Minister has already taken the first step with an inquiry into the Queensland fires, fuelled, like all megafires, by uncontrolled scrub growth. Our future can be certain – it’s up to us – we can choose between wilderness, holocaust and pestilence or sensible land management for a healthy and safe environment.